In April 2014 students and teachers from Estonian Academy of Arts in Estonia, Novia University of Applied Sciences in Finland and Campus Gotland at Uppsala University in Sweden gathered in southern Gotland for the fourth of five intensive courses within the project Traditional Wooden and Masonry Structures in the Baltic Sea Region. As we visited some of the 80 historic windmills on the island a question arose concerning the number of windmills in Finland, Estonia and mainland Sweden. Students were given the task to study the windmills in their own country in general and one of the three Nordic–Baltic types each in more detail. The result of these studies shows that some 550 Finnish windmills have survived through the last centuries although their machinery was out of date already a hundred years ago and although the majority of them have not been in use since the First World War. The situation of Estonian windmills is somewhat more critical. 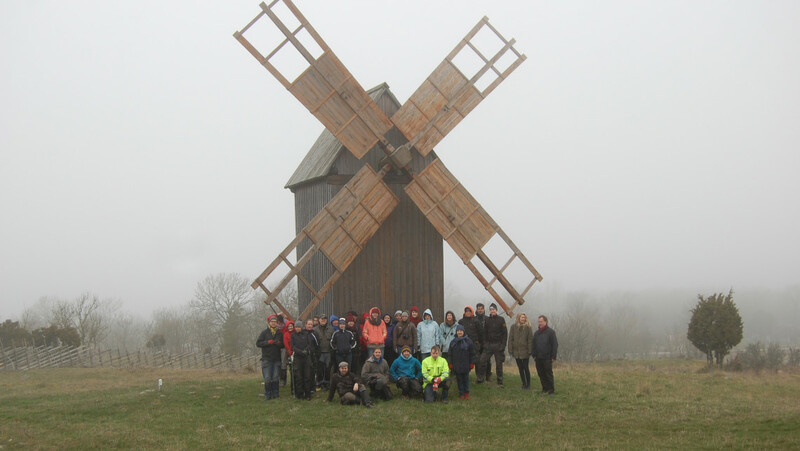 During the intensive course within the project Traditional Wooden and Masonry Structures in the Baltic Sea Region, which took place in the village of Eksta on southern Gotland, new sails were built for the historic windmill at Siger farm. Furthermore, the work included repairing the old wind shaft and the installation of the newly built sails. The work was led by the local builder Tage Wickström together with Dan Lukas, the windmill expert from Estonia and Joosep Metslang from the Tallin open air museum, Rocca al Mare. With the joint effort of these three experts, helpful neighbours and 24 students the job was finished in just three days. The site had been prepared well in advance by local builders and the master of Siger farmstead. Our thanks go to Ph. D. Joakim Hansson, lecturer at Uppsala University who hosted the intensive course on Gotland; and to the local builder Tage Wickström and his staff. We also thank Joosep Metslang, researcher at Rocca al Mare open air museum in Tallinn who led the building of new sails for Joakim’s mill; and Dan Lukas, the doctoral student at Estonian Academy of Arts, for repairing the wind shaft of the mill and offering his expertise in the restoration process.